The Bachelor of Business Administration in Accounting is a three-year programme. Applicants can apply for admission to Year 1. This programme develops students’ professional competencies and broadens their knowledge of accounting and related disciplines. Students are introduced to financial accounting, management accounting, law and accounting information systems. Graduates can seek employment as professional accountants or in related fields. 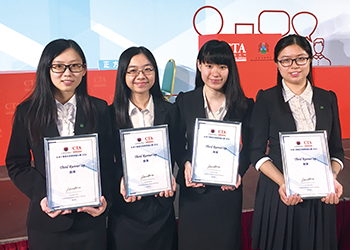 Three full-time accounting students participated in the Tax Debate Competition organized by the Taxation Institute of Hong Kong on 28–29 May. The OUHK team finished in the top four out of ten teams and was awarded the third runner-up place.